Personal Files Organized at Last! The last estate management milestone of 2014 was reached on December 18, 2014. 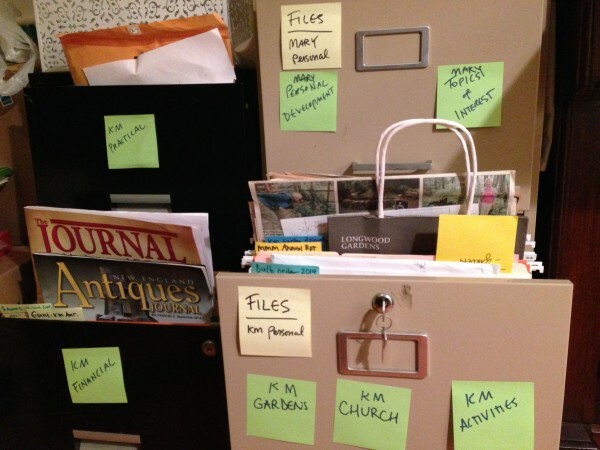 We now have the beginnings of a personal filing system where we can better locate practical papers (e.g. auto and medical receipts, house repairs), personal interests (e.g. newspaper and magazine clippings of fun things-to-do), personal finances (e.g. banking and retirement), and personal hobbies (e.g. gardening research and projects by year). Climbing up and out of the wreckage dementia dealt us has been a very long process (keeping in mind we buried my mom on New Year’s Eve, January 31, 2008).